In every workplace, you will have difficult coworkers. Dealing with difficult coworkers, bosses, customers, clients, and friends is a skill worth perfecting. Dealing with difficult situations at work is challenging, yet rewarding. You can vastly improve your own work environment and morale when you increase your ability to deal with the people at work. You also make your workplace a better environment for all employees when you address the problems that a difficult coworker is causing for the team. You can increase your skill in dealing with the difficult people who surround you in your work world. These tips will help you. Difficult people are found in every single workplace. Difficult people come in every variety that you can imagine. But, how difficult a person is for you to deal with depends a lot on such factors as your self-esteem, your self-confidence, how closely you must work with him on a daily basis, and your professional courage. Dealing with difficult people is easier when the person is just generally obnoxious or when the behavior affects more than one person. You can team together to address the behavior or inform management to get help addressing the employee issue before it spirals into negativity. Dealing with difficult people is much harder if the individual is publicly undermining your professional credibility or attacking you personally like a bully. Do you think that you work with a bully? You do if you regularly feel intimidated, dread to work anywhere near a particular co-worker, and feel dismayed and upset about having to go to work. If you are yelled at, insulted, and put down, you work with a bully. If you have felt psychologically or physically threatened at work, you work with a bully. Do you have a coworker who talks over you at meetings, who regularly criticizes your performance, and steals credit for your work? If you answer yes to these questions, the chances are that you’re one of 54 million Americans who has been targeted by a bully at work. Some coworkers wallow in their negativity. They don’t like their jobs, and they don’t like working for their company. They always have bad bosses who are jerks who always treat them unfairly. The company is always going to fail, and its customers are worthless and demanding. You know these negative coworkers—every organization has a few. You can best deal with these negative coworkers by avoiding their presence at work. Confronting a co-worker is never easy, but it's often needed if you stick up for your rights at work. 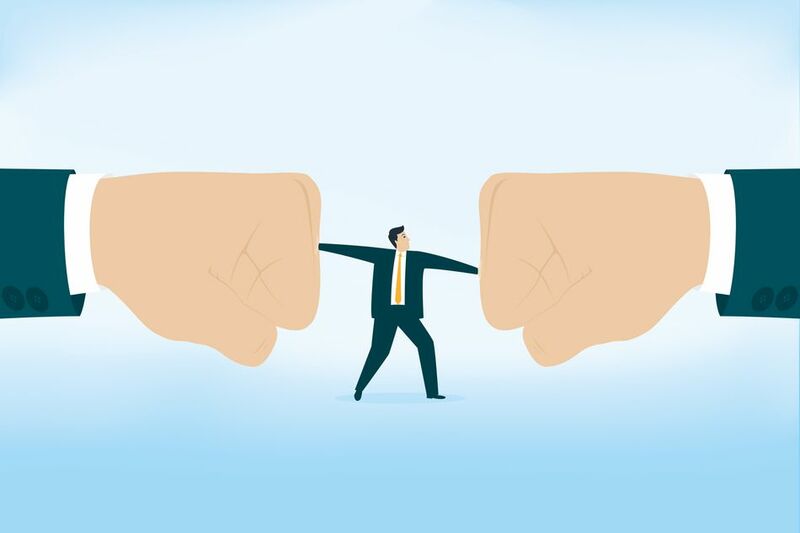 Whether the confrontation is about sharing credit for work accomplished, coworker habits and approaches that are irritating or sloppy, intentional missed customer delivery deadlines, or about keeping a project on track, sometimes you need to confront your coworker. Although confrontation should not be your first step, you can become better and more comfortable with necessary conflict. These tips will help you feel more comfortable when you need to confront a coworker. You can ruin both your job and your career by the relationships you develop with your coworkers at work. Your education, experience, or title don't matter if you can't play well with your coworkers. You won't succeed in your career without forming positive relationships at work. Effective relationships, with the boss and coworkers, create success and satisfaction on the job. Learn more about seven effective work relationship musts. Have you encountered any of these examples of needing to deal with difficult people at work? They're just examples of the types of behavior that cry out for responsible feedback from a coworker or boss. But, for most people, holding a difficult conversation about a sensitive topic is challenging at work. These steps will help you hold difficult conversations when people need professional feedback provided professionally. Holding a difficult conversation can have positive outcomes; here's how to attain them. Have you worked with a coworker who had annoying habits such as loud gum chewing or bringing personal issues to the office every day? How about a coworker who had personal hygiene problems or exuded the smell of alcohol and coffee at work? You know what a productivity downer these kinds of behavioral and personal issues can present in the workplace. If you want to attain some happiness at work, you must address these issues. Do you need some help and ideas about how to hold a difficult conversation? Here's how you can courageously address coworkers who have annoying habits in your workplace. Nothing is more destructive in the workplace than difficult bosses. Every employee has bosses who provide direction throughout their working careers. Hopefully, most of your bosses are competent, kind, and worthy of your trust and respect. They play such a significant role with the employees who report to them. Bosses can make or break an employee's day. Too often, employees have difficult bosses who have a negative impact on their desire to engage and contribute in the workplace. You want to be well known and liked among the people the company regards as superstars, allies who have power and will speak up for you. You can achieve job security if you are viewed as a superstar by your organization. Building alliances at work is smart and effective behavior when you want to develop positive coworker relationships. The alliances are also crucial for dealing with difficult or destructive coworker behavior in the workplace. Gossip is rampant in most workplaces. It often seems that people have nothing better to do than gossip about each other. They gossip about their co-workers, their managers, and their company's prospects for success. They frequently take a partially true fact and blow it all out of proportion to its importance or intended meaning. Dealing with difficult situations involving gossip occurs in every workplace. Find out how dealing with difficult gossip is a must-do and a can-do. You can obliterate destructive gossip from your workplace.